The UK government's chief scientist has advised ministers that badgers should be killed to prevent the spread of TB among cattle. Sir David King says culling could be effective in areas that are contained, for example, by the sea or motorways. His report follows a previous study that said culling badgers would be ineffective. The Independent Scientific Group found that targeting one site would only cause badgers to flee to other farms. The report was submitted to the Department for Environment, Food and Rural Affairs in July and published on Monday. Sir David said: "Together with five well-respected experts, I have assessed the ISG report and other research relating to badgers and TB in cattle. "It is clear that badgers are a continuing source of infection for cattle and could account for 40% of cattle breakdowns in some areas. "Cattle controls remain essential but I consider that, in certain circumstances and under strict conditions, badger removal can reduce the overall incidence of TB in cattle." About 2,500 cattle a year get bovine tuberculosis (bTB), and some 30,000 stock are killed every year because of the disease, according to the National Farmers' Union. The union also believes a cull is necessary to curb TB in cattle. The Department for Environment, Food and Rural Affairs (Defra) said the issue was "extremely difficult". It was committed to "evidence-based policy decisions" but no decisions were imminent, it said. The Independent Scientific Group (ISG) assessed the results of a nine-year experiment to discover whether killing badgers would stem the spread of disease. 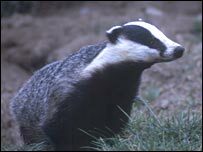 Its findings, published in June, said badgers did play a role in the spread of bTB. However, it warned that the culling would have to be so extensive it would be uneconomical. Why not look at inoculating the cattle instead of culling badgers? It found that although TB infection dropped in the immediate area of the cull, it increased on adjoining farms, in effect shifting rather than solving the problem. Professor John Bourne, author of the ISG report, said Sir David's recommendations were not consistent with the scientific findings of his report but were "consistent with the political need to do something about it". Sir David denied he was influenced by government. "I would never give advice based on pressure from politicians - that's precisely what went wrong in the BSE episode," he told the BBC. Dr Richard Yarnell from the Badger Trust said the latest report amounted to a "shameful political fix" and it "beggared belief" that the government was even thinking about implementing a cull. Peter Kendall, president of the National Farmers' Union, told the BBC the disease was "devastating" many farming communities and the government should take heed of the new recommendation. Farmer Peter Ganblett from Wootton Bassett, Wiltshire, said farmers had exhausted all the advised preventative measures, including putting feed troughs higher and trying to keep badgers out of buildings. "All those things we have done to no avail because the one aspect no one has been prepared to look at is the link between cattle and badgers," he said. "The problem we are up against is everyone has the image of lovely, fluffy badgers galloping about, but cows are also entitled to lives." The Conservative Party said the government's policy on bovine TB had "descended into a shambles". Jim Paice, shadow agriculture minister, said: "Only a month after the Independent Scientific Group on cattle TB published its final report, the chief scientific adviser was confirming what we and many farmers believed, that the report did not adequately address the problem of bovine TB. "What is shocking is that it has taken a further three months for this latest report to be made public." While most cattle farmers may support a cull, it would prove unpopular with the public. A government consultation of more than 47,000 people found that more than 95% of people were opposed to the idea. The report comes ahead of Sir David giving evidence to the Environment, Food and Rural Affairs select committee on Wednesday.